John Wiley & Sons, 9781118443613, 236pp. 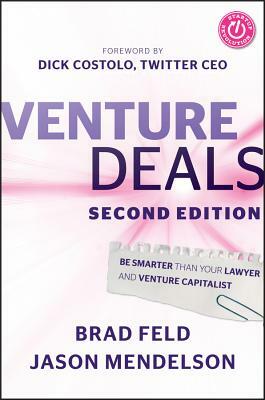 Brad Feld has been an early-stage investor and entrepreneur for over twenty years. Prior to cofounding Foundry Group--a Boulder, Colorado-based early-stage venture capital fund that invests in information technology companies all over the United States--he cofounded Mobius Venture Capital. Prior to that, he founded Intensity Ventures, a company that helped launch and operate software companies. Feld is also a cofounder of TechStars and has been active with several nonprofit organizations. He is a nationally recognized speaker on the topics of venture capital investing and entrepreneurship. Jason Mendelson has over a decade of experience in the venture capital and technology industries in a multitude of investing, operational, and engineering roles. Prior to cofounding Foundry Group, he was a managing director and general counsel for Mobius Venture Capital, where he also acted as its chief administrative partner overseeing all operations of the firm. Mendelson was also an attorney with Cooley LLP, where he practiced corporate and securities law with an emphasis on representation of emerging companies in private and public financings as well as mergers and acquisitions.